Tired of the barbecue, the beach or the kids? Then get away from it all and top up your skills and knowledge with some project management brain food. What does PRINCE2 suggest is the direct input to the Project Quality Plan? Answer at the bottom the page! If you use PMP, try Legnita Press for free PMP PMBoK 4th Edition practice exams. 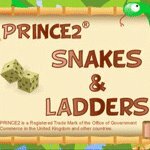 While the kids are playing their games, play your own with the addictive PRINCE2 Snakes and Ladders Exam Prep Game available as an iPhone app for £4.99 and with PM Tools’ fun game, PM Hangman, which asks you to guess project management terms. If you have a few minutes spare then spending them on YouTube videos on PRINCE2 might fill them nicely. Didn’t do too well on the quizzes or games? Want to pass your exam and extend your general project management knowledge? Consider adding the following books to your library. PRINCE2 Bundled Book Pack Best Practice Bookstore, RRP £120.00. 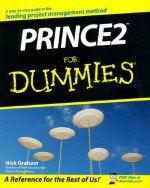 PRINCE2 for DummiesSave money on the individual prices by purchasing the combined PRINCE2 book pack, giving you everything you need to pass the PRINCE2 Foundation and Practitioner examinations. 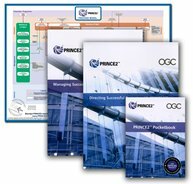 The bundle includes the Managing Successful Projects with PRINCE2 Manual, Directing PRINCE2 Projects with PRINCE2 Manual, Pocket book and Process model. Implementing the Project Management Balanced Scorecard by Jessica Keyes, 252 pages, Taylor & Francis, RRP £49.99. Linking the scorecard concept to principle project management steps such as determining scope and risk management, the book proposes the framework as a way for project managers to achieve strategic objectives. It comes with an abundance of resources and a helpful accompanying CD. Getting Naked: A Business Fable About The Three Fears that Sabotage Client Loyalty by Patrick Lencioni, 240 pages, John Wiley & Sons, RRP £16.99. Out earlier this year, this book by fable-king Patrick Lencioni defies service providers to leave their comfort zone and make themselves vulnerable and transparent to clients. Lencioni explains his idea by means of a story where the fictional characters in one company learn all about client service from the people in the company they are taking over; an interesting way to challenge preconceptions. Free resources and tools at Patrick Lencioni company, The Table Group. On the other hand, if you cannot bear to read a whole book, then a selection of project management publications, like Lencioni’s, is available as short summaries in everything from PDF to e-book reader from companies like getAbstract, Soundview Executive Book Summaries and Business Summaries. An assortment of project management e-books are available from Amazon, WH Smith, Blackwell and Waterstones. If you do not have an e-book reader and want to know more about them, then some of the best are reviewed by Which? Reviews, Telegraph.co.uk and PC Pro. Three newly available e-book platforms are discussed in the August 6th edition of The Independent Newspaper. Finally, whether you are stuck with the kids or stuck at the office and need to see the funny side of project management, try a little light relief from the jokes and sayings on Project Training UK, Bright Hub and MarioAlexandrou.com and from the wry cartoons on everything – including project management - on Geek & Poker. What does PRINCE2 suggest is a direct input to the Project Quality Plan?